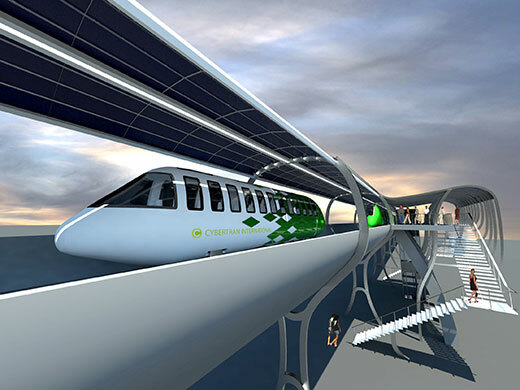 CyberTran is a unique passenger rail system that works more like an elevator than a traditional transit system. Rather than running on a defined schedule, a computer-controlled system responds to passenger needs in real time. Passengers input their destinations at a station, and after a small amount of time has passed, vehicles arrive to deliver the passengers directly to their destinations. Multiple small vehicles and off-line stations allow for this level of flexibility and responsiveness. No unnecessary stops, no worrying about train schedules – just hassle-free transportation. The average speed for CyberTran vehicles in typical light rail corridors is around 50 mph, and they operate on electricity that can be generated by solar panels in the right of way (or from any other power source on a typical electrical grid). In lieu of drivers, operators monitor and control vehicles from a centralized control room. CyberTran vehicles are designed to carry a small group of passengers directly from one station to another. Holding approximately 20 people in a more luxurious atmosphere than the typical bus or subway car, their small size means that they are also significantly lighter weight, reducing structural and power requirements and guideway construction costs. 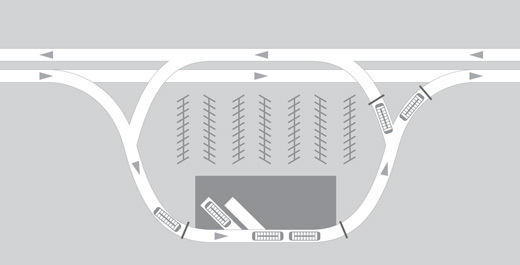 Vehicles are computer-controlled using a root level collision avoidance system to maintain safe operating conditions at all times. CyberTran runs on grade-separated guideways so that it does not interfere with other vehicular or pedestrian traffic, increasing safety. 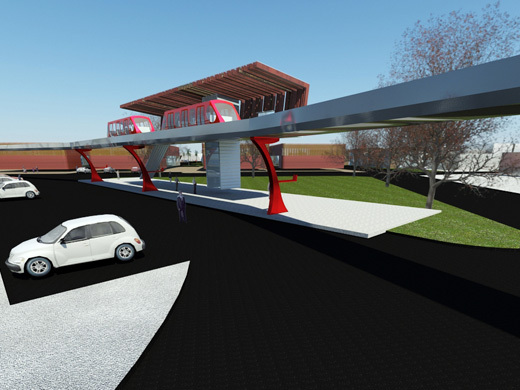 Due to the small size and low weight of the vehicles, guideway construction cost is significantly less than other systems, and tracks can be run on existing bridges and in highway medians. Each CyberTran station is located off of the main line, allowing vehicles to bypass others entering or waiting at a station. When a vehicle is ready to depart, it comes to full speed before returning to the main guideway. This simple design change improves average speed and passenger convenience. Vehicles are stored in the stations when not in use, so they are always available.